It's official. It's been exactly ten years since the first episode of Gossip Girl graced our TV screens. Yeah, I feel old. I remember watching the adverts in the run up to the first season, and making sure I was ready for when the first episode hit. I hooked from the very beginning. The drama, relationships, the love triangles -everything bout this show had me wishing for that ultra-chic life of coolest teenagers on the Upper East Side. Gossip Girl did a lot for our generation. I believe it had a big impact on social media, I mean, come on, bloggers have a lot to thank GG for. It put Blake Lively on the map for being a total style icon and the actress to watch. It brought us some incredible one liners -I'm Chuck Bass- and of course it brought us Dorota. 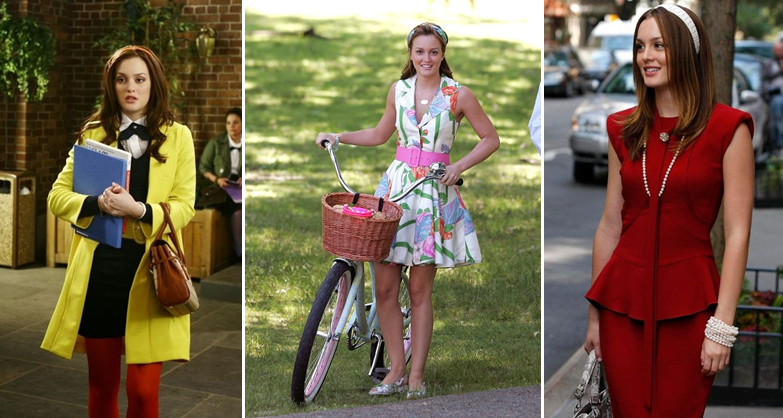 But if I'm going to be honest, the main reason we tuned into GG week after week, was the incredible fashion. Rocking the seasons It-bag and beautiful designer pieces put our school uniforms to shame. Blair and Serena taught me a lot of things about dressing up, and brought me a ton of inspiration along the way. Naturally, I'm going to start with my favourite Upper East Sider, Serena Van Der Woodsen. Free Spirited Serena had that messy, just thrown-together, laid-back look that also screamed "I'm ready to party whenever." Said to be inspired by Kate Moss, this blonde's style was a whirlwind of vintage pieces, designer items and statement accessories, that came together to create the most perfect bohemian influenced looks, with a little rock chic thrown in for good measure. I think the stylist's also took a little inspo from Van Der Woodsen's actress, Blake Lively, as well. But I mean that's a whole other blog post (which i will get to). Serena had some of the best story lines on the show and could make anyone and everyone fall in love with her. But it was her unique hippy style that people probably loved the most. She sure had me shopping after each episode. Blair Waldorf was not just the ultimate Queen B of Constance, but the Queen B of schools across the world. Played by the beautiful Leighton Meester, B was a new take on the bitchy mean girl that's found in almost every teen drama. She was cunning, smart and, most importantly, loyal to those she loved. Whilst iconic style moments dominated the Upper East Side, Blair was always one step ahead of the pack. Business-chic meets glam meets perfectly preppy. She had an outfit for every occasion, and of course, took high end designers to the next level. I mean her mum was Eleanor Waldorf. We have her to thank for colourful tights, co-ords and bringing headbands back for a brief but intense moment. Also, I think it's important we give this Valentino slip it's own special shoutout. It deserves it. This dress plus that make out scene was iconic. I can't listen to Sum 41's Without you, without thinking of the limo scene. S1E7 proved Blair was, is, and will always be, Queen. While Blair Waldrof may be the undisputed Queen of Constance, it was Jenny Humphrey that gave a damn good go at trying to de throne her. In the first season, Little J, played by Taylor Momsen, was trying to work her way up in the social hierarchy, was very sweet and innocent, and her style was a little too try-hard Blair Waldorf. By the end of the second season, however, Jenny had started designing her own clothes and customising store brought pieces. Within a couple of seasons, she had transformed into full on emo, mixing Courtney Love's grunge look with DIY designs. Momsen rocks dark and moody like no other, and she's stated in interviews that her own personal style slowly worked it's way into the Gossip Girl wardrobe. Whether you love or hate Little J, you can't deny she's got style. P.S- Honourable shoutout to my favourite pair of BFFs. Listening to: Pretty Much- Would You Mind. Disclaimer: None of the photos are mine but I have edited them. I have credited where I found each photo but am unsure as to who the original photographers are. If you know, please contact me so I give credit where necessary. Reading & Leeds 2017 | My Recommendations. Boardmasters 2017 | My Recommendations.